Social Networking – Tales by a Socialite! 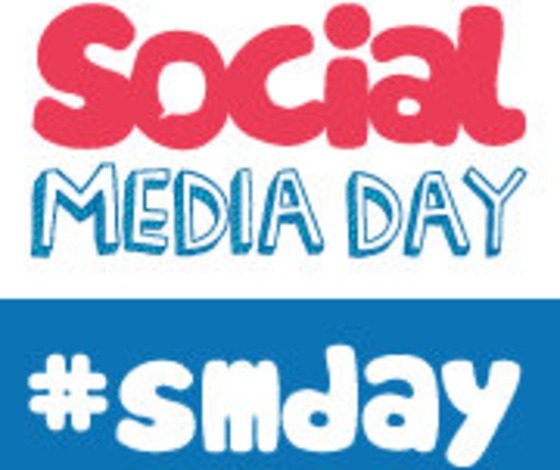 Social Media Day – Social Media what? A global event started by Mashable – Pete Cashmore, thanks man! But I think; it has lost it’s cause, at least bits of it. Why do I feel so? #Twitter might go public, easy reason of depression already even though Mr. CEO says – “Money doesn’t drive us, it’s just oxygen”. My point exactly. “That’s what makes it everything”. 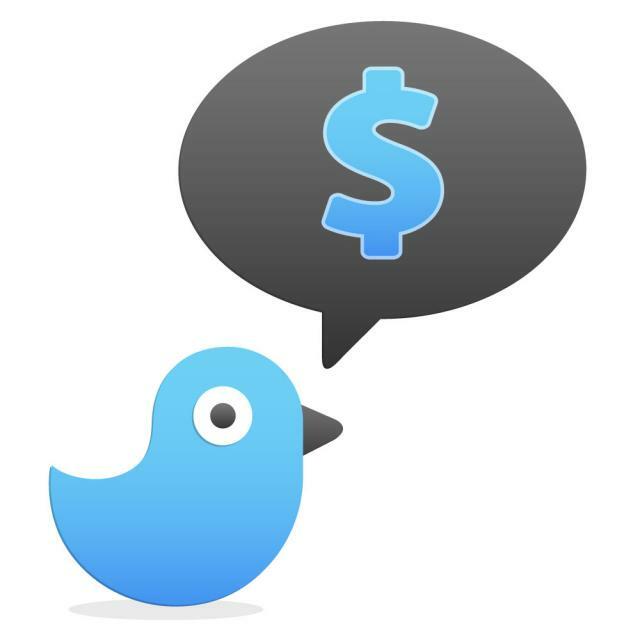 Anyway, coming back to Social Media Day, June 30th, every year, I recognize it’s existence but no matter how much fun it sounds, it’s a money driven business like any other. I see, Digital departments of corporations and/ OR Digital Agencies, they are number driven. It’s as good as like, someone like – Adolf Hitler sitting on your head with a gun pointed at you, that if you didn’t get 1 million fans or 10,000 followers; you will be fired. Now, you and me, both know, Adolf Hitler, has no idea about Social Media, whatsoever. His accomplice told him or I must say influenced him by saying, numbers drive this business. Yeah, what a ‘mess’. In an documentary with BBC- Saud bin Abdul Muhsin Al Saud, Governer of Ha’il province, Kingdom of Saudi Arabia, said: [Rephrase of his statement] “I am the super-power, I can make a statement and it will be a rule effective immediately but will the people accept it? It’s not like something which is considered to be “Haram” will be accepted even by the supreme power – In here, he essentially talks about Women driving in KSA, getting a chance to speak and other rights. Not sure if I am right but I at least know I am not wrong. Okay, for rest of the 30% – 35%, hats off for actually thinking/ planning every aspect; but you will get my vote only once it pops out for good. Hope to see some fun in 2014. So, I am sure, a lot of you would have thought of it but my question is, why is it still not there? Out of tons, the keyboard manufacturing companies, of course, I can only name a few such as ‘Microsoft’, ‘Apple’, ‘Dell’, ‘Logitech’, ‘hp’ etc. none of them came up with this. Why? How cool would it be to have an Enhanced keyboard which is so much internet savvy, good for the conglomerates involved in mass communication, media and teenagers, of course. Yeah, that’s too much of a cliché. But is that just because of a company patent war? Of course, I understand every one wants to be the no. 1 in terms of branding; but can you stop the battle for a second and actually be human-centric? Lets do it the people way! “Negative conversations ride x10times faster than Positive” – Author Unknown. With respect to the above fact which indeed is very true, lets measure the Social Media on this ground. After all, what is Social Media, it is people again and how people are in real life, its very likely that they are the same on their Social Accounts. How something gets viral? It begins with a news about something or someone, most comes out of rumor or a newsroom. But whilst that happens, Social Media Junkies are all over it and hence viral is viral in no time, without the discretion of whether something deserves to be viral or not. Once in line, it will surely go all the way. No stopping at all. And when I say no control, I mean absolutely no one can control it across all Social Media platforms especially “twitter”. Thus, negative or positive, if it started floating, it will only come down after at least 24 minimum hours. 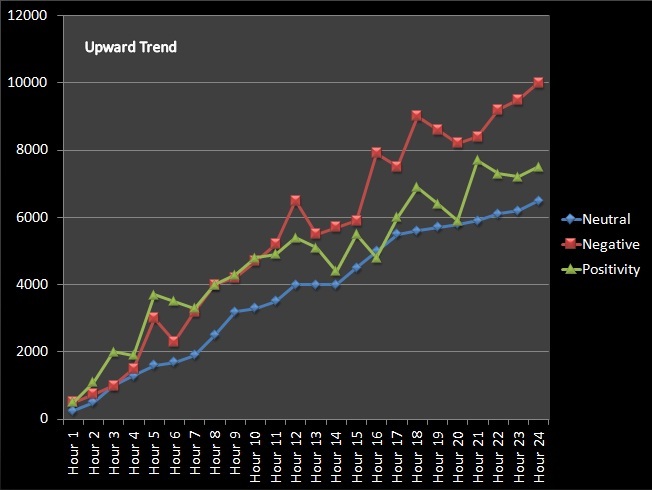 No matter whether the trending is of a subject, a person or even a news, the above trend chart just takes the sentiment from people and immediately begins measuring as soon as the posts are in a few hundreds/thousands & ranges upto the next denomination which generally represents millions & in rare cases billions. 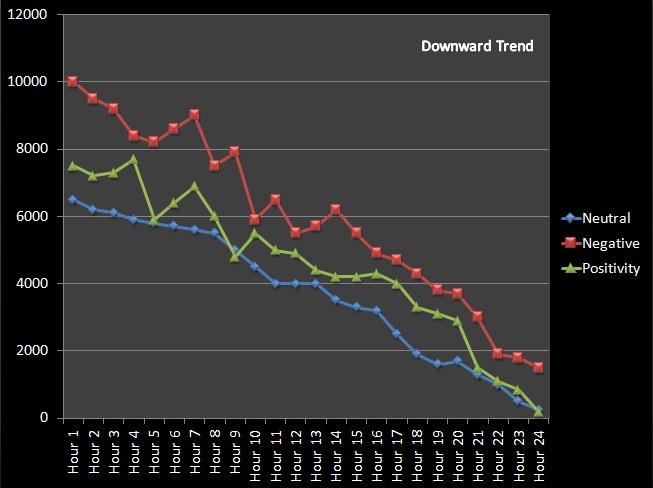 As we can clearly see that the things with negative sentiment have an almost straight pattern, is the clear indication of how negativity spreads quicker than anything else. Why? This is majorly because of the thick competition which exists in the world now. For eg. I never knew what my cousin was doing a few years back but now when I see him on my facebook timeline, it gives me goose bumps, my mind automatically gets into a competitive mode and I start thinking of something which I can post to beat him. Yes, I know this doesn’t happen with every post or every person but come on, admit this, that we all have direct & indirect competitions in our lives and by whom we are affected on daily basis. And that’s how complex it can get while the upward trending is on for the first 24 hours. Are things clear now? If not, here is the explanation: Negative subjects don’t calm easily, they travel from one nation to another, one continent to another and it doesn’t necessarily follow the above trend because it completely depends upon the gravity of the situation: For eg. “Earthquakes” a negative situation/a natural calamity, doesn’t stay for long and falls quickly. However, news on Justin Bieber and Selena Gomez will not wash away quickly. Its ironic how the above two examples have no correlation between them, yet when it comes to trending, they fall in, in opposite trends. The simple summary is now-a-days people don’t care about global warming, earthquakes etc. The paradigm has shifted towards financial situations, scams, celebrities, presidential statements, influential people. This shift has happened because we are able to see what is the other person doing. The world was at peace before, now its not. We have started the war ourselves. 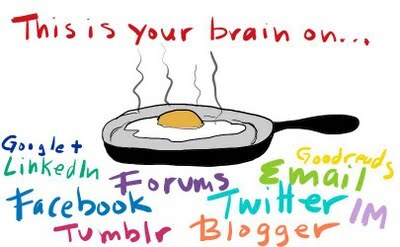 Social Media Today is extremely crucial but at the same time there is an overdose happening which cannot be controlled.